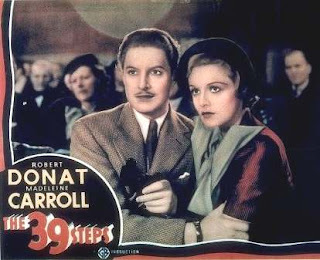 Similar to Hitchcock's later movies Saboteur and North by Northwest, The 39 Steps is about a man who is accused of a crime he did not commit and then dragged into intrigue in order to clear his name, saving some people and possibly the world along the way. The major difference: No one scales a national monument. This time the hero is Richard Hannay. During a performance by the amazing "Mr. Memory," Hannay meets a spy who runs to him for protection and then is murdered in his home. Hannay must flee to avoid being arrested for her murder. While on the run, he falls in hate with a lady on a train who gives him away, tries to complete the spy's mission, and then rediscovers and eventually falls in love with the lady from the train. They hate each other so much, you just know they'll end up together. The first time I watched The 39 Steps I couldn't get past the way that our hero treated his leading lady. He was obnoxious. I finished the movie, declared him to be a jerk, and reported to my dad that it was far from being my favorite Hitchcock. It's a few years later now, and thanks to my dad making me watch this movie again, I can now give it three stars and say that yes, I would see it again.